The early years of the US Mint were marked by a scarcity of resources. Working dies sometimes had their date modified to extend their lives beyond the year of manufacture. All 20,266 of the 1802 half cents were struck from an unused leftover 1800 die, after a small 2 was punched over the second 0 in 1800 to read as 1802. In other words, every 1802 Half Cent is a 2/0 overdate. The obverse die was matched with a couple of different reverse dies, creating two distinct 1802 half cent varieties. The "Reverse of 1802" die has a stemless berry attached to the right branch of the wreath between the stem and lowest leaf pair. This feature is not seen on any other Draped Bust Half Cent. The "Reverse of 1800" die was the same reverse used on other Draped Bust Half Cents. Of the two types, the 1800 reverse is by far the rarest. Only about 5% of the surviving 1802 half cents are of this variety. As you might expect, prices are very high, starting at around $25,000. The coin featured on this page, having the 1802 reverse, is a highly collectible coin in its own right, yet remains within the reach of a bigger group of collectors, costing at least $1000 to purchase an example. There is an interesting subplot with regard to the 1802 Half Cent. Numismatic researchers have uncovered evidence suggesting all them were struck from botched Large Cents (recorded by the early US Mint as "spoiled cents"). On a tiny few 1802 Half Cents (guesstimated to be a dozen or so), some Large Cent details remain visible where the re-striking pressure failed to eradicate them. As you might expect, these particular examples carry significant premiums. 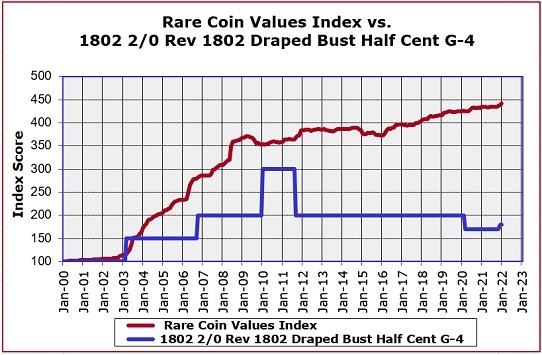 The blue line above represents the percent change since the year 2000 in retail value of the 1802 2/0 Rev 1802 Draped Bust Half Cent in G-4 condtion, starting at a baseline index of 100. The red line measures the overall direction of the rare US coin market during the same time period, as determined by the Rare Coin Values Index. The rise in value of the key date 1802 Half Cent rates below the Index performance. The 1802 2/0 Rev 1802 Draped Bust Half Cent is one of 87 coins tracked in the Index, which is updated monthly.